DRESSIGNER - Custom Dressmaking & Alterations of Bridal Dresses & Wedding Gowns by Dressmaker & Seamstress Malgo - truly custom dress design I am not accepting any cutstom gowns any longer, alterations only. "Imagination is more important than knowledge.Knowledge is limited, imagination encircles the world." -Albert Einstein what does"custom made" really mean? Your custom made dress is always original and unique, one-of-a-kind, because it's designed and made as one piece and only for you. We begin with a consultation involving design, style, proportion, fabric selection, garment details, timing etc. The complete service involves taking measurements, pattern drafting, developing a fitting muslin sample before cutting your fashion fabric into particular design, several muslin fittings, actual dress fittings for final adjustments, pressing. The entire process may take up to 3-6 months, and as many appointments as is necessary to assure desired result. During the fittings you may request some changes to the garment if they will be possible. All of that is done for your individual body measurements your unique needs and... just for this one particular dress. It's made here, in the US at the Dressigner's studio. The phrase "custom made" is often misunderstood and taken advantage of by businesses which offer made-to-measure. That is something completely different than custom made, it lacks the fittings, and often sent overseas to be made. "CUSTOM MADE" IS COMPLETELY UNIQUE AND THE MOST PERSONALIZED DRESSMAKING SERVICE AVAILABLE consultation The consultation for a custom wedding gown is $30 for up to 1hour and by appointment only. Pease try to consult via e-mail first, although I won't be able to give you teh exact extimate until discussing all the details in person with you. Collect pictures of your favorite garments and pencil in any changes or details you want added. Bringing photos from the magazines of necklines, bodices, skirts, and trains is crucial, and helps you communicate in presenting your own ideas. I will discuss your preferences and vision. I will educate and help you determine what style works best for your individual silhouette as well as in the selection of fabrics and appliques. You may choose them from the samples I offer, or decide to purchase your own. Your detailed measurements will be taken at the first consultation; it's extremely important to wear your best fitting undergarments at that time. 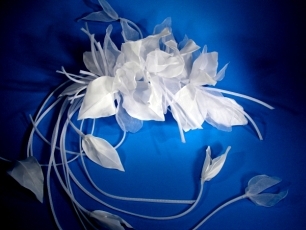 You will receive a written contract specifying your gown, including a firm price. A down payment of 25% is required before my work begins and subsequent payments at the time of each fitting. how much does it cost? 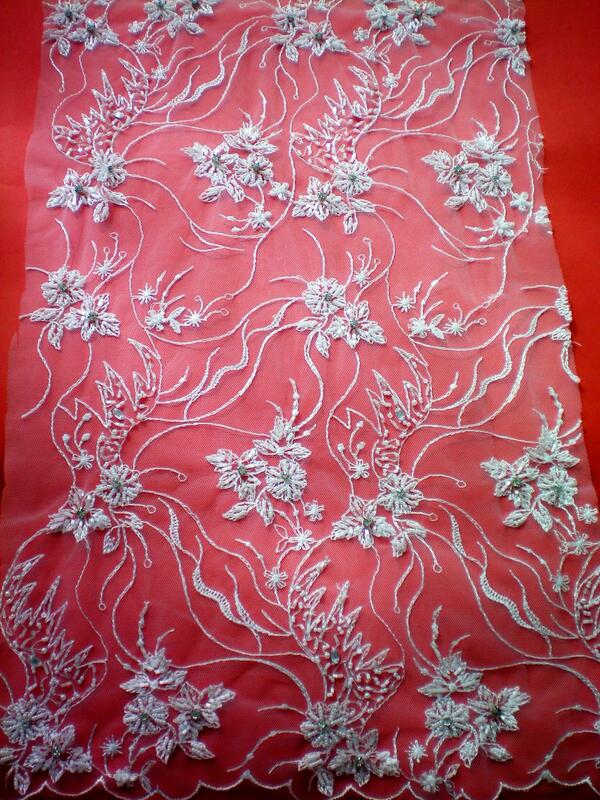 Custom dressmaking is a very detailed and time consuming process. It may take up to 30-60 hours to design and create a gown, and sometimes even longer. I guarantee professional highest quality garment construction and finish. Complete service involves: consultation, designing, taking measurements, pattern drafting, developing a fitting muslin sample before cutting your fashion fabric into particular design, muslin fittings, actual dress fittings for final adjustments, pressing and steaming. The entire process may take between 2-5 months, and as many appointments as is necessary to assure desired result. All this is done for each garment, for your individual body measurements and your unique needs. Finished product is going to be beautiful and ready to wear, no alterations needed. 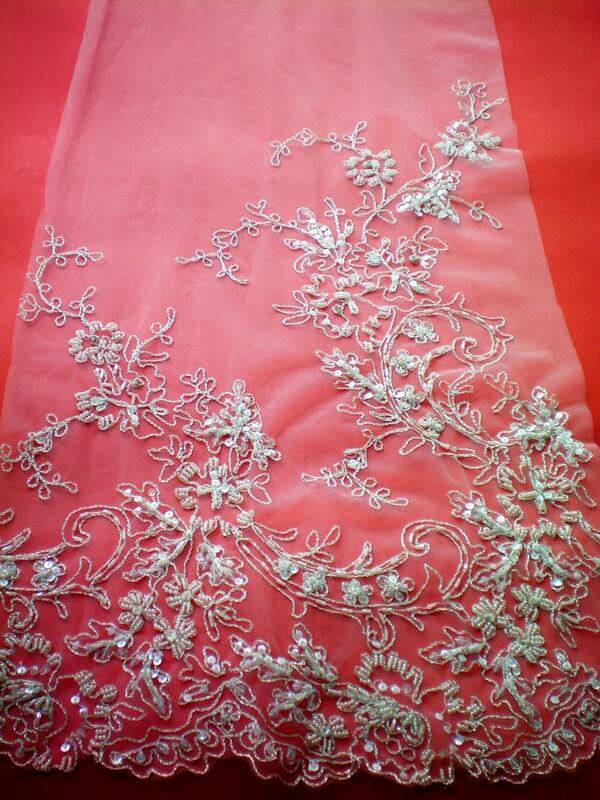 Custom bridal gowns prices range from $1500-3500. The specified price doesn't include the cost of fabrics. The cost of fabrics may vary from $50-$500. 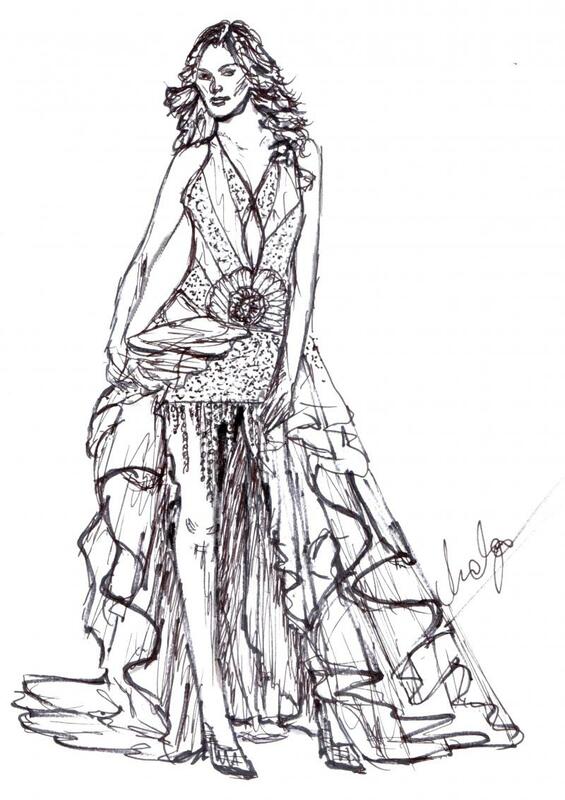 Please e-mail me drawings or pictures of dresses for a rough quotes before scheduling an in person consultation. I am able to make only up to two custom dresses per year, so please inquire early. custom gown fittings You will take part in the entire designing and creating process. 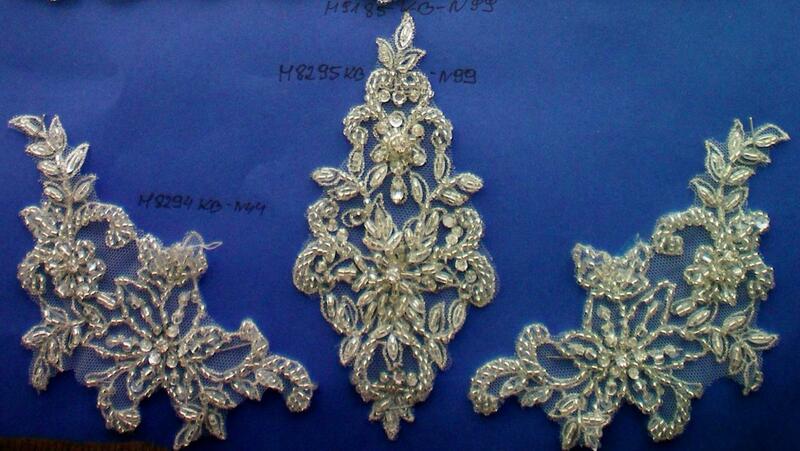 Each gown requires 3-8 fittings, depending on its complexity. At your first, and most important, fitting you will be presented with a muslin version of your gown. Muslin is a sample dress usually made out of white cotton fabric. It serves as a sample dress for making fittings and major adjustments to the pattern. This techinique protects the original fabric for your dress from being handled too much and damaged. Next, your original dress is cut and slowely put together. Each fitting will bring you closer to the gown you envision. As you watch your dream gown come to life, you may add or change some of its details. It's essential to bring your shoes and the same best fitting foundation garments to each of your fittings. 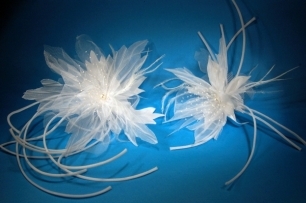 This will ensure that you will get that perfect fit on your special day. Undergarments can make a difference of up to 2 inches on hemline or waist and also show if dress will be too revealing in any area. Allow up to three months for the completion of your creation. During the fittings you may request additional services or changes to the garment if they will be possible, but those will be charged accordingly. I am not accepting any cutstom gowns any longer, alterations only. Knowledge is limited, imagination encircles the world." what does"custom made" really mean? Your custom made dress is always original and unique, one-of-a-kind, because it's designed and made as one piece and only for you. We begin with a consultation involving design, style, proportion, fabric selection, garment details, timing etc. 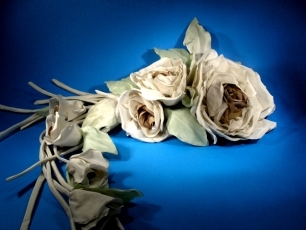 The complete service involves taking measurements, pattern drafting, developing a fitting muslin sample before cutting your fashion fabric into particular design, several muslin fittings, actual dress fittings for final adjustments, pressing. The entire process may take up to 3-6 months, and as many appointments as is necessary to assure desired result. During the fittings you may request some changes to the garment if they will be possible. All of that is done for your individual body measurements your unique needs and... just for this one particular dress. It's made here, in the US at the Dressigner's studio. The phrase "custom made" is often misunderstood and taken advantage of by businesses which offer made-to-measure. That is something completely different than custom made, it lacks the fittings, and often sent overseas to be made. The consultation for a custom wedding gown is $30 for up to 1hour and by appointment only. Pease try to consult via e-mail first, although I won't be able to give you teh exact extimate until discussing all the details in person with you. Collect pictures of your favorite garments and pencil in any changes or details you want added. Bringing photos from the magazines of necklines, bodices, skirts, and trains is crucial, and helps you communicate in presenting your own ideas. I will discuss your preferences and vision. I will educate and help you determine what style works best for your individual silhouette as well as in the selection of fabrics and appliques. You may choose them from the samples I offer, or decide to purchase your own. Your detailed measurements will be taken at the first consultation; it's extremely important to wear your best fitting undergarments at that time. You will receive a written contract specifying your gown, including a firm price. A down payment of 25% is required before my work begins and subsequent payments at the time of each fitting. 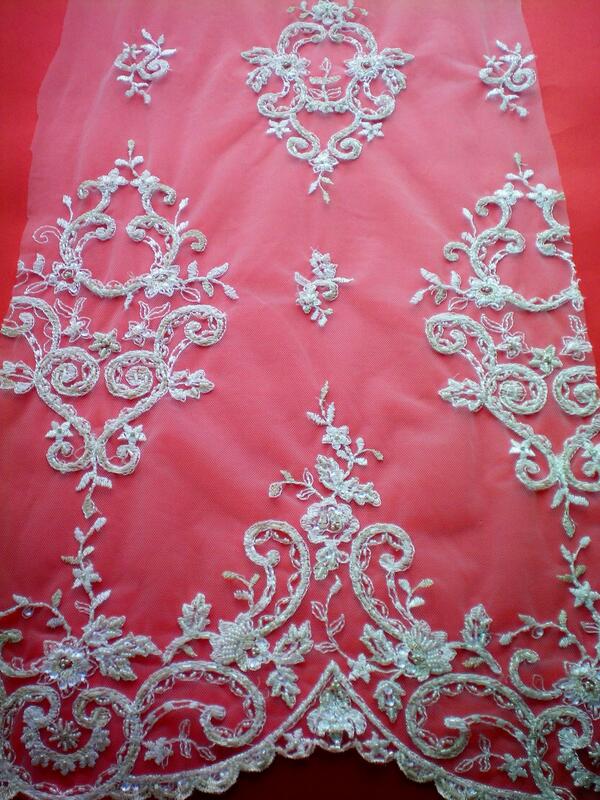 Custom dressmaking is a very detailed and time consuming process. 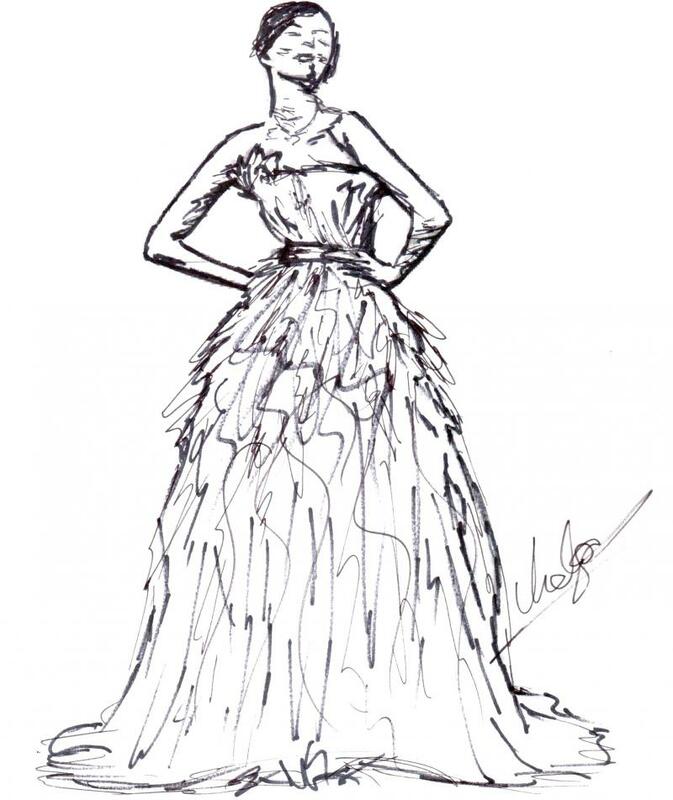 It may take up to 30-60 hours to design and create a gown, and sometimes even longer. I guarantee professional highest quality garment construction and finish. Complete service involves: consultation, designing, taking measurements, pattern drafting, developing a fitting muslin sample before cutting your fashion fabric into particular design, muslin fittings, actual dress fittings for final adjustments, pressing and steaming. The entire process may take between 2-5 months, and as many appointments as is necessary to assure desired result. All this is done for each garment, for your individual body measurements and your unique needs. Finished product is going to be beautiful and ready to wear, no alterations needed. Custom bridal gowns prices range from $1500-3500. The specified price doesn't include the cost of fabrics. The cost of fabrics may vary from $50-$500. 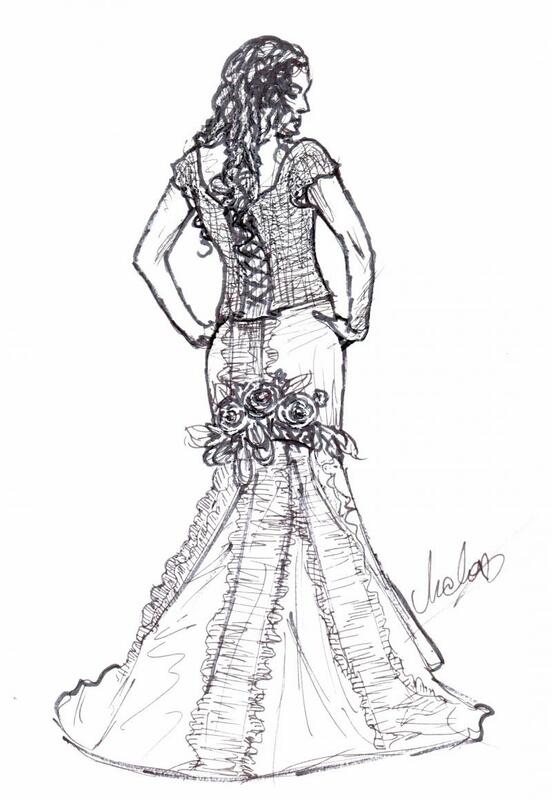 Please e-mail me drawings or pictures of dresses for a rough quotes before scheduling an in person consultation. I am able to make only up to two custom dresses per year, so please inquire early. You will take part in the entire designing and creating process. 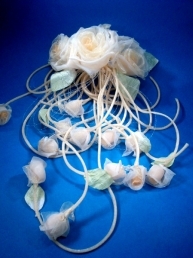 Each gown requires 3-8 fittings, depending on its complexity. At your first, and most important, fitting you will be presented with a muslin version of your gown. Muslin is a sample dress usually made out of white cotton fabric. It serves as a sample dress for making fittings and major adjustments to the pattern. 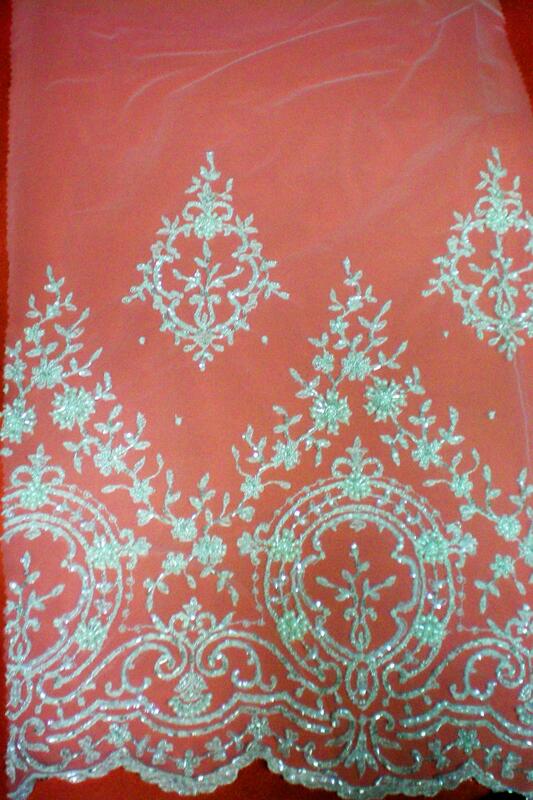 This techinique protects the original fabric for your dress from being handled too much and damaged. Next, your original dress is cut and slowely put together. 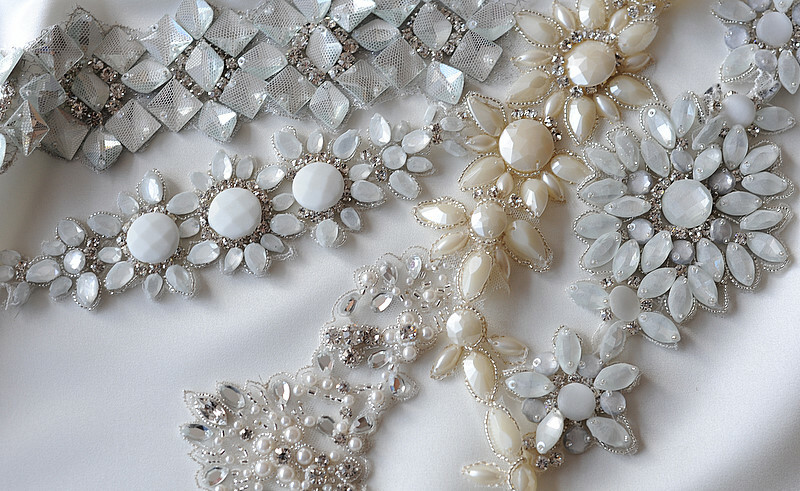 Each fitting will bring you closer to the gown you envision. As you watch your dream gown come to life, you may add or change some of its details. It's essential to bring your shoes and the same best fitting foundation garments to each of your fittings. This will ensure that you will get that perfect fit on your special day. Undergarments can make a difference of up to 2 inches on hemline or waist and also show if dress will be too revealing in any area. Allow up to three months for the completion of your creation. During the fittings you may request additional services or changes to the garment if they will be possible, but those will be charged accordingly. 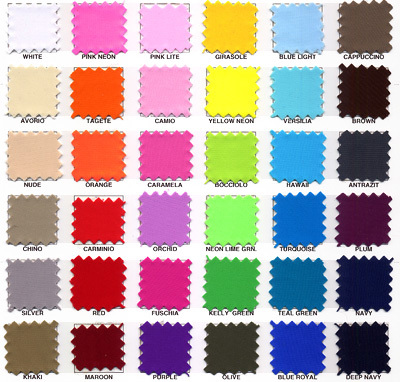 For clients ordering custom garments I offer a wide selection of fabric samples to choose from: 102 colors of several kinds of silk, over 60 colors of bridal satin, over 70 colors of chiffon, and much more. They can be ordered from my vendors. I strongly advise not purchasing any fabrics prior to consultation. 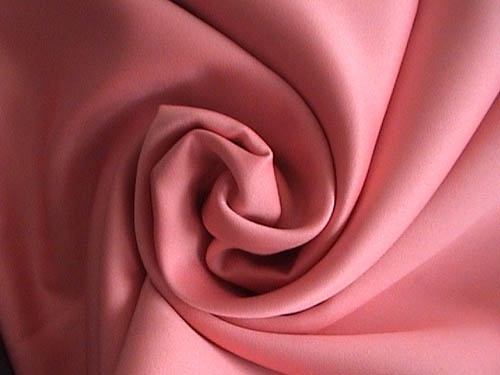 The fabric quality, texture or fibers may not be suitable for the chosen style of a dress. It's a great idea to bring swatches of fabrics you wish to purchase for the consultation. 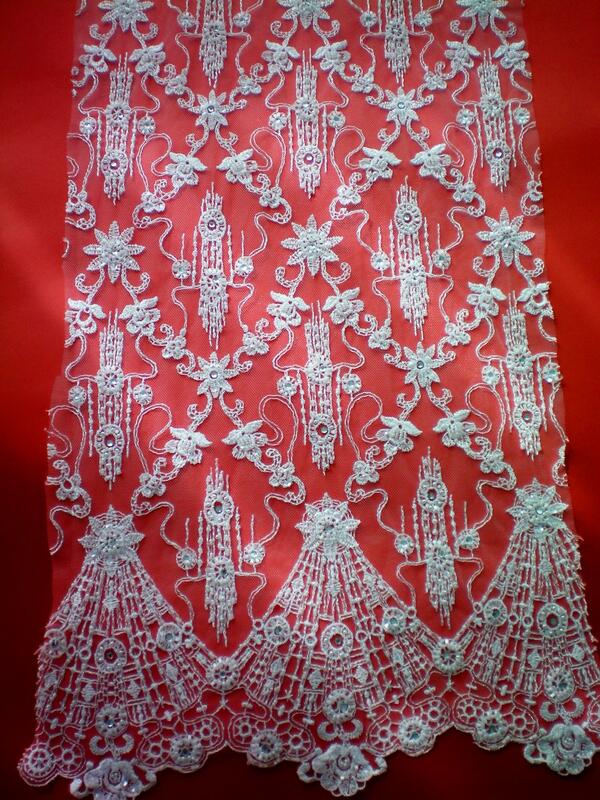 I also offer some beauriful beaded embroideries, trims and appliques which I imported from France, Spain, Poland, India and China (the pictures show some examples); they are tulles and organzas embroidered with swarovski crystals, pearls, sequins and beads. 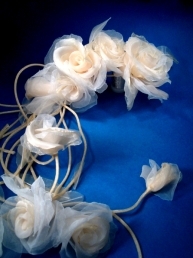 I import very unique designer hand made fabric dress flowers from Europe. 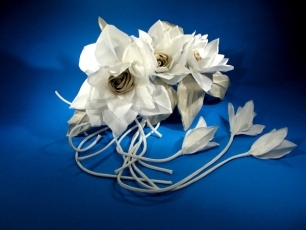 They are made out of taffetas and chiffons They may be ordered in any custom color and form.